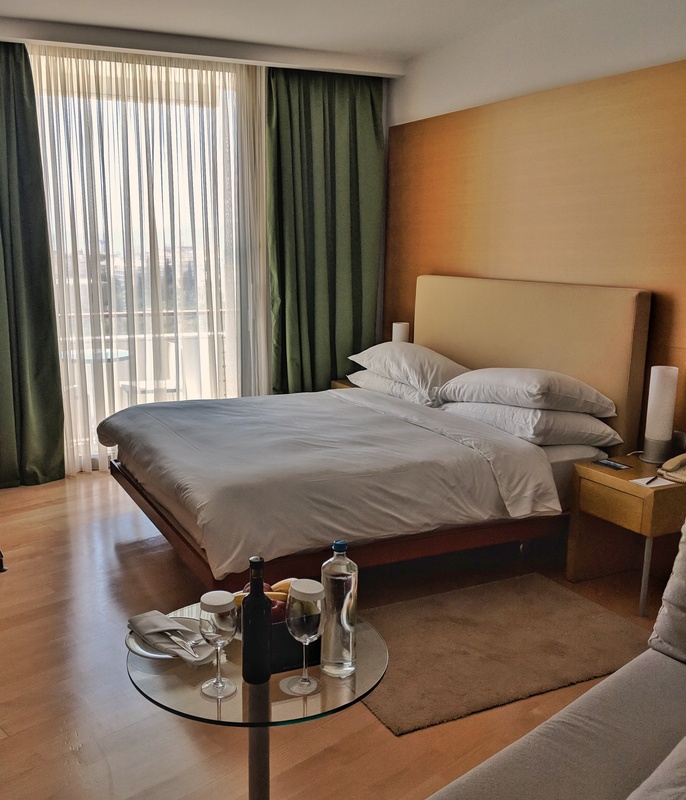 It was the photos of the magnificent Hilton Athens Hotel building that convinced us to pick this property over the rest. And while I did mention we were attracted to the curvaceous building, we have to admit, the outside appearance does not do justice to the interiors. The inside is immaculate and spacious, and the attention to details is commendable. 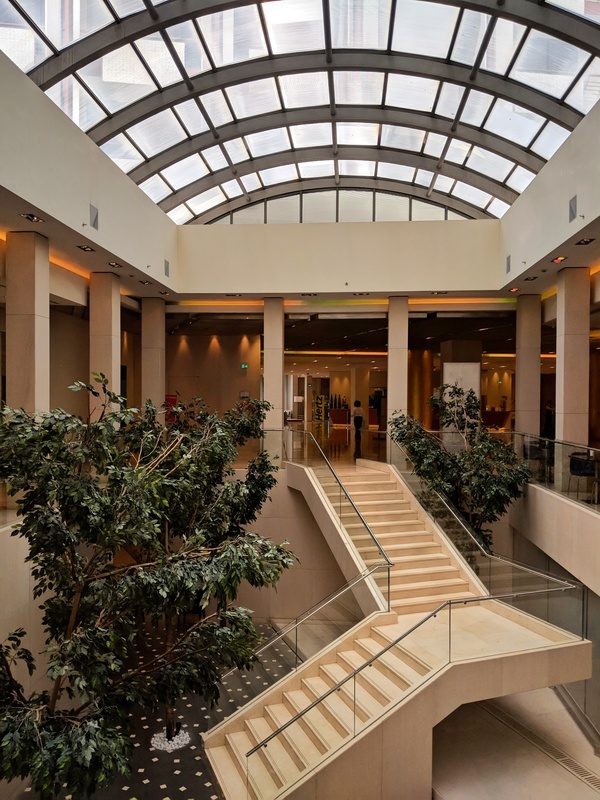 The first thing that one would notice as one walks in is that Hilton Athens Hotel is a true open space work of art. 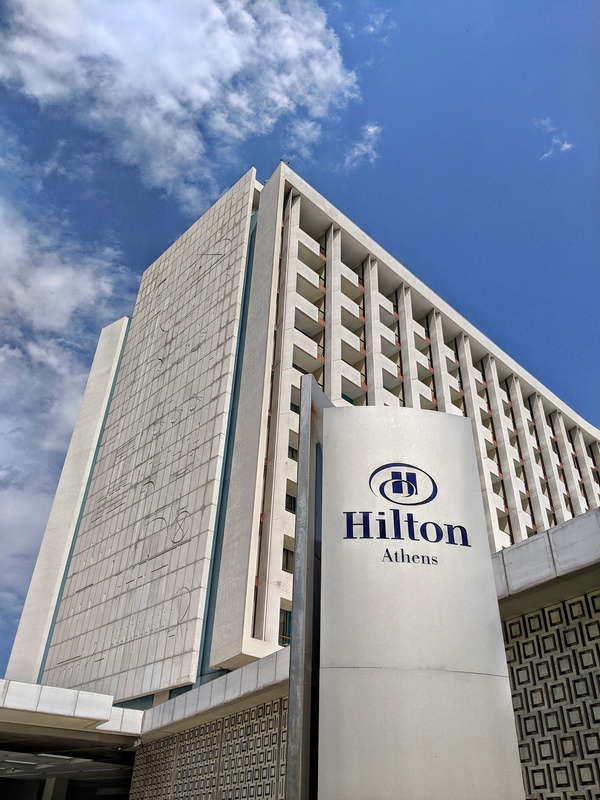 Hilton Athens Hotel is a historical site in itself and is surrounded by various other heritage sites on all sides. The intimate property boasts of 506 rooms, all of which ensures great views. 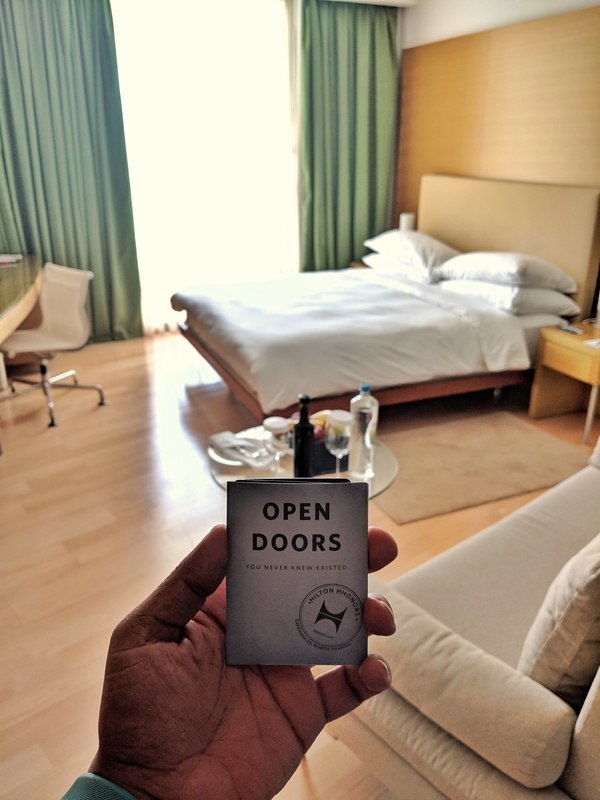 And while there are a variety of rooms on offer, we suggest you opt for a room that overlooks the Acropolis, for a truly memorable vacay. We stayed on the executive floor, room #1142, which also houses the executive lounge. Each executive room comes equipped with a comfy and cozy double bed, a cute balcony, super speed wifi and a spacious bathroom with a bathtub. 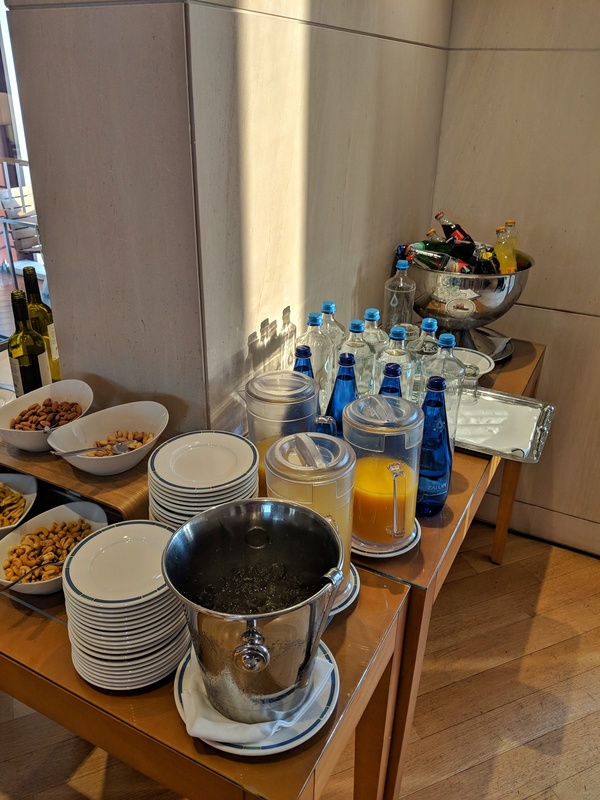 It also features full access to the Hiltonia Spa facilities (Indoor Pool, Sauna, Hammam, Jacuzzi, Gym), as well as access to the Executive Lounge with complimentary continental breakfast, snacks and beverages throughout the day. While we did not experience the massages as we had just got one done very recently, we did take out an hour to relax in the jacuzzi and then headed to the sauna. Once back to our room, completely relaxed, our heart and mind wanted to laze around indoor, but stomach wasn’t favoring us. So we had to literally drag ourselves to the rooftop Galaxy bar and restaurant to satisfy our growling tummy’s desire. 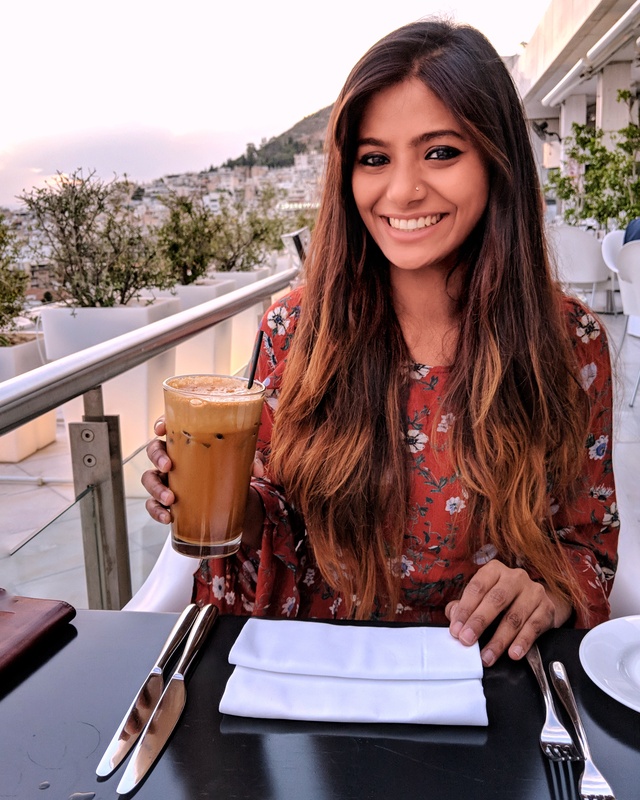 Well, no regrets, because we dined at one of the most picturesque rooftop restaurants, witnessed the most gorgeous sunset in Greece, while sipping on our fancy mock tails, and relishing different varieties of sushi dishes. 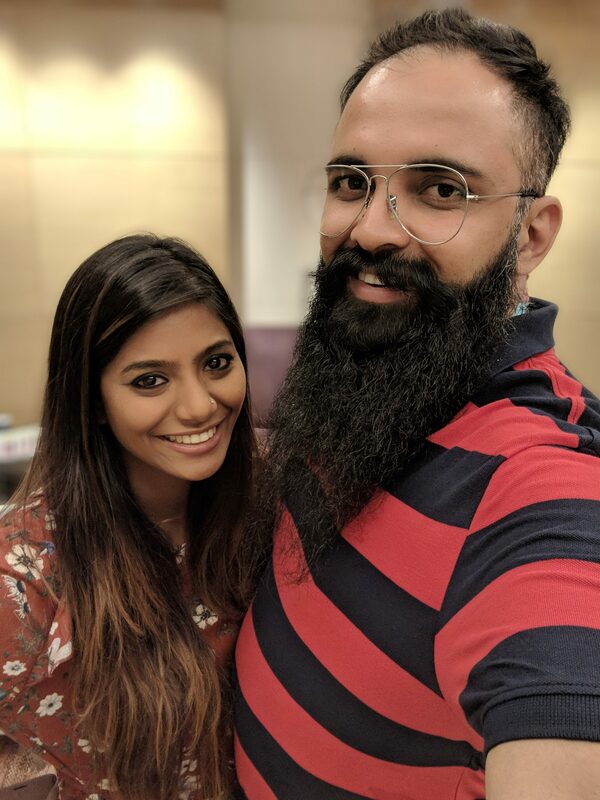 It was an evening to remember – the panoramic view, the fiery orange sunset sky, some brilliant sushi, and of course the company. 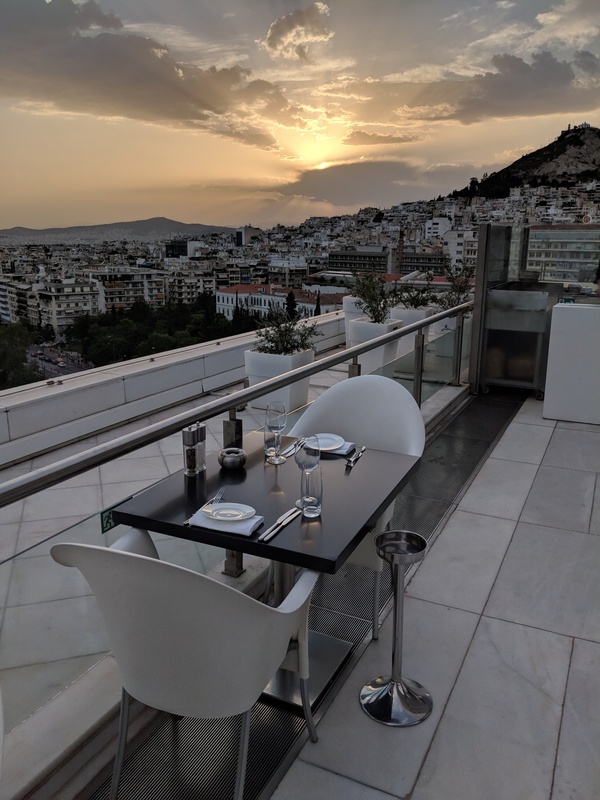 The Hilton Athens Hotel offers a plethora of dining options, 5, to be precise. 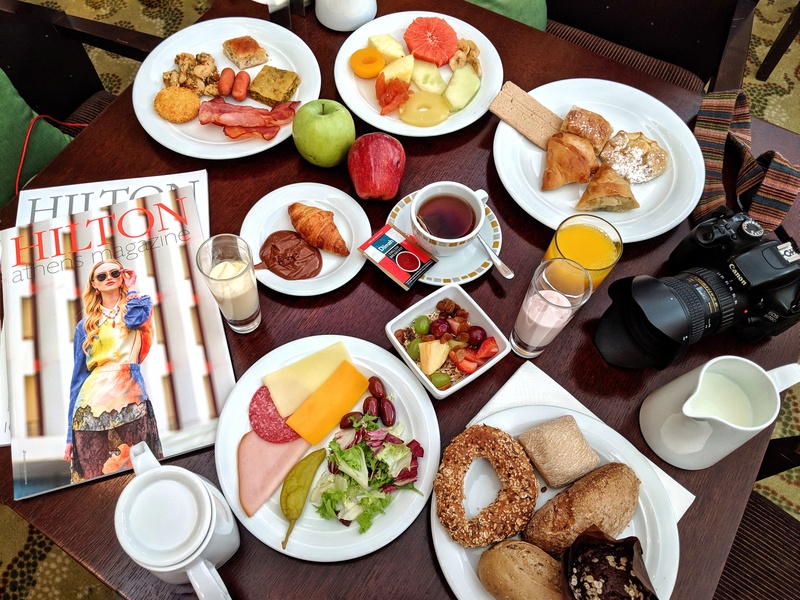 Post a happy and a good night’s sleep, we breakfast-ed at the Byzantino restaurant the next day. It was a lavish spread of breads, cereals, fruits, salads, juices, meats, dressings, and all things breakfasty. 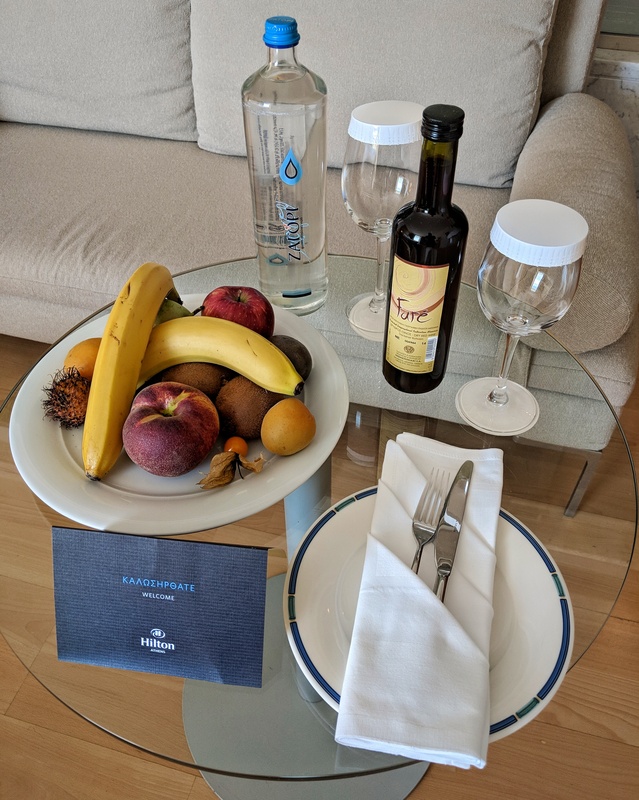 We made sure we experienced almost all the services that Hilton Athens Hotel offers to their guest, but we saved the best part for the end. So with a happy tummy, I decided to laze by the pool and write my next blog. Shagun on the other hand, being a water baby since forever, took a plunge into the tempting pool. While I sat under the sand Grey umbrella on my spacious sunbed, trying to get some inspiration from my luxurious surroundings, Shagun was busy working on his tan inside the blue blue waters, under the blazing sun. It was a beautiful day filled with food, cuddles, some blog work too, sunset and more food. 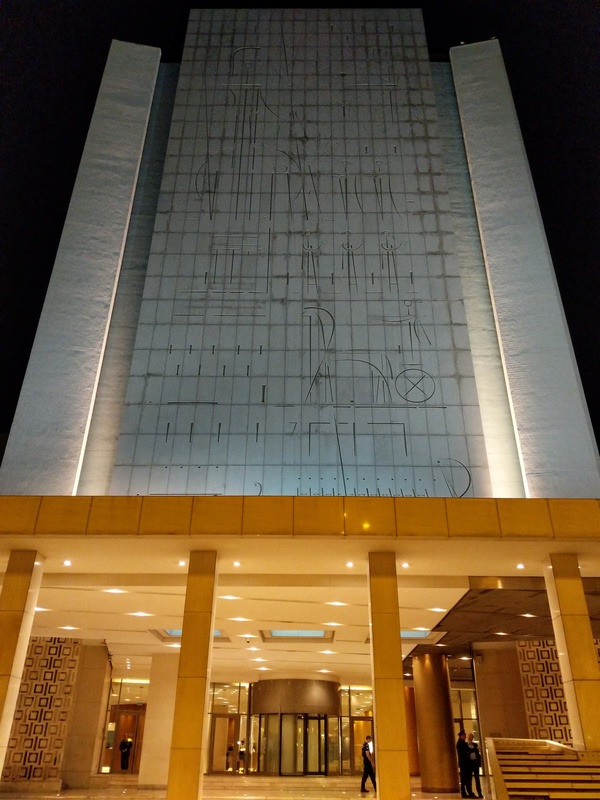 Well, like all good things come to an end, our stay at Hilton Athens Hotel too was over. What makes this property special is Its fuss-free, simple, minimalistic, and soothing ambience. 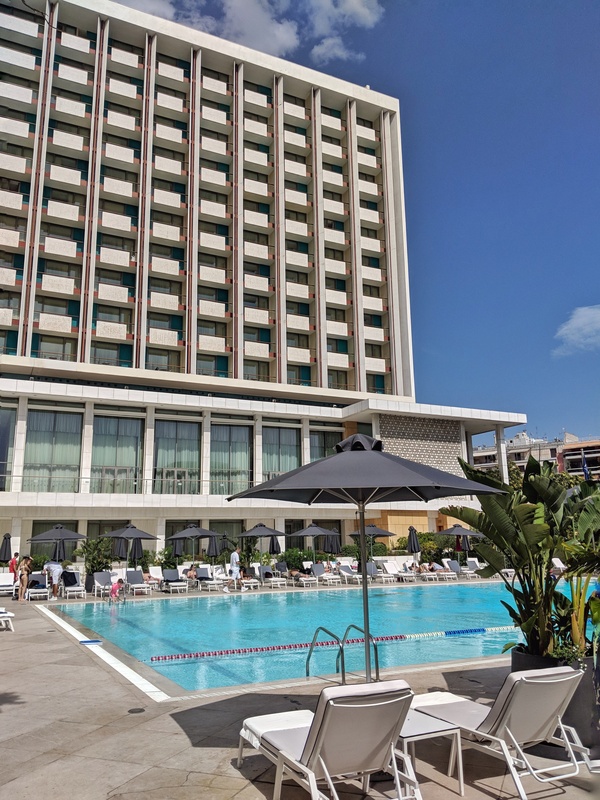 Location: Hilton Athens Hotel stands tall in the city center at Leof. Vasilissis Sofias 46, Athina 115 28. How to reach: 25 mins away from the airport by direct subway. Clientele: Thanks to its brilliant location, the hotel is a place to many business meetings, and short stay travelers. Design aesthetics: A heritage property with an Iconic facade. Light and bright is the main lobby, surrounded with amazing artwork. Spacious rooms with terrific city views. Activities: Gym, heated pool, outdoor swimming pool, spa and beauty treatments. USP: Living up the Athens history with a modern touch. 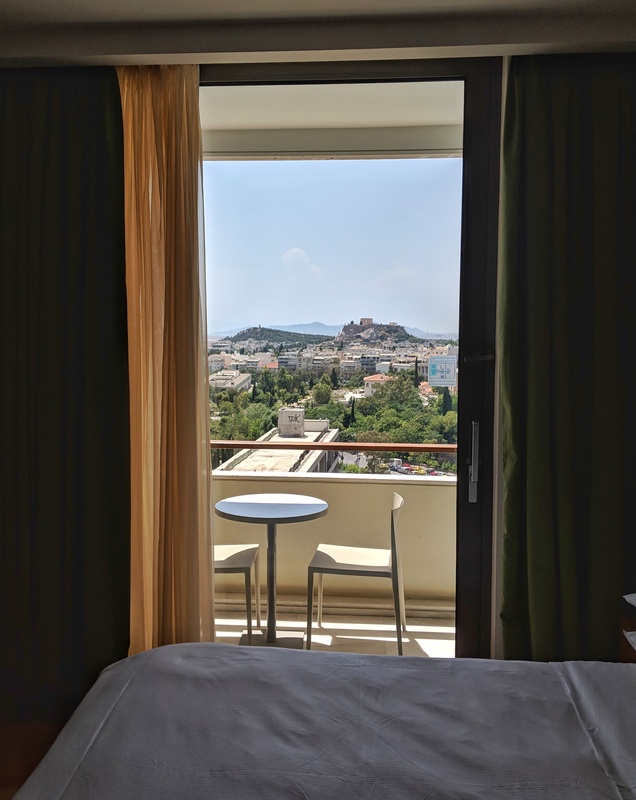 Tip: Rooms with a view of the Acropolis, especially with a balcony are worth the extra cost!